A film by Julian Schnabel is like if a Terrence Malick movie had actual focus; the American painter turned filmmaker, like Malick, has made some very artistically driven films in the past, including The Diving Bell and the Butterfly which he was nominated for the Best Director Oscar for, but unlike the more recent films that Malick has put out – including his most recent, the inherently awful Song to Song – Schnabel’s films at the very least have some kind of focal point to centre all of their artistic ambitions around, whether it’s the story of a man with locked-in syndrome (as in the aforementioned Oscar-nominated movie) or a biographical depiction of Reinaldo Arenas (as in Before Night Falls, which starred Javier Bardem in a breakout role that also saw him nominated for an Oscar). It’s vital that Before Night Falls is mentioned in this conversation, by the way, because Schnabel’s latest film At Eternity’s Gate has a very similar track record to his other film; it’s a biopic of a noted artist, for which the lead actor was Oscar-nominated for Best Actor, and it also happens to be a visually arresting and intriguing piece of work – again, the exact opposite of what Malick has been put out recently, so the biggest mystery is why Malick doesn’t seem to take notes from this guy’s work instead. 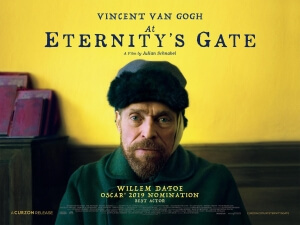 At Eternity’s Gate follows the final years of struggling painter Vincent Van Gogh (Willem Dafoe), who’s shacked up in a small residence within a quiet town in the south of France. There, he paints whenever he feels inspired, which luckily for him is quite a lot of the time; however, his deteriorating mental state doesn’t make him particularly warm company for the townspeople, and that accompanied by the fact that nobody at the time seems to like or appreciate his artistic skills leads him further down a path of depression and, as well all know about Van Gogh’s life, self-inflicted tragedy. However, rather than simply going for a straightforward biopic with only the confirmed facts as its source, Schnabel takes cues from several accounts that contradict certain aspects about his life, including the incorporation of a popular myth surrounding his ultimate fate. Its departure from what has been widely accepted to be the truth could potentially alienate some of the most profound Van Gogh scholars, but even then the movie is not so concerned with being just simply a movie about the life of one of history’s most celebrated artists; it is, like Van Gogh’s work, an artist’s interpretation of the world, unique enough to stand out while also offering a different perspective on how the rest of us view things. Schnabel accomplishes its arthouse intentions through Benoît Delhomme’s provocative and experimental cinematography, which makes strong use of handheld camerawork, wide-angle close-ups of character’s faces, extended POV shots, and unconventional blurring of certain parts of the screen; again, this could very easily be an alienating aspect for the audience, who may find themselves confused and discombobulated from all of its challenging, even surreal, photography, but it’s visually impressive enough to leave you intrigued by this director’s style as well as how it is telling this tragic story through simple, often wordless, means. Dafoe, the film’s sole Oscar nominee, is expectedly wonderful in the lead part, but what may not be quite as anticipated is how much he really sells the sheer melancholy lying underneath this man’s skin. Van Gogh was known in life to be a solemn, depressive figure so overcome by his artistic eye that in the end he couldn’t mentally keep up with the world’s endless beauty, and what Dafoe manages to do so beautifully is really dig deep beneath the surface and put on display his pure vulnerability in a world that doesn’t like or understand him, making him a figure who we admire for his love of painting but also his extraordinary and unique vision of the world. You really feel for this guy as he’s tormented by ignorant villagers, including being rampaged by a group of bratty schoolchildren that are egged on by their teacher’s quite hurtful comments on his art, and then later being physically assaulted after attacking a child that was throwing rocks at him, before later being flung into a mental asylum after the well-known incident with his ear. Even more stinging, however, is how not even those closest to him can seem to make much effort to comfort him in his time of need; his art merchant brother Theo (Rupert Friend) is away a lot of the time, and when his friend Paul Gauguin (Oscar Isaac) comes down to visit it doesn’t end so well when Gauguin announces his intentions to leave. The film shows how isolating and tragic Van Gogh’s life was, which makes it so fascinating that his art only started becoming popular after his untimely death, when nobody even bothered to care about him when he was alive. I hate to keep going back to Terrence Malick here, but again it’s like this and Schnabel’s other movies are what Malick should set out to be; big and ambitious art projects that actually have a sense of depth to them, as opposed to being nothing more than a series of random (but pretty) images strung together extremely loosely with no rhyme or reason. I would even go so far as to say that Schnabel, though his directorial career has less credits thus far as Malick does, has become a far more reliable filmmaker, because at least you will get something substantial out of his films more than most of the other guy’s work. Hopefully, At Eternity’s Gate is a continued step in the right direction for him. At Eternity’s Gate is an artistically ambitious perspective on the life of Vincent Van Gogh, which mostly succeeds thanks to a stunning palette of visuals and a winning Oscar-nominated lead performance by Willem Dafoe.